Though I’m a hairstylist, I’m pretty low maintenance when it comes to the beauty stuff. I keep my routine pretty simple, but here are some products I cannot live without. I cannot profess my love for this product enough, I mean what’s not to love? This is a product that can be confusing to understand, but let me break it down. Dry Shampoo is corn starch in an aerosol can & the purpose is to absorb grease & oil, then you brush out the product, leaving a clean, residue-free canvas. It’s perfect for people that, a) skip shampoo days, b) enjoy texture, & lived in hair, c) volume lovers. I’m all of thee above. My favorite use for dry shampoo is to enhance the texture of my hair! Because my hair is naturally straight as a board I like when it has a messy, lived in look, so what I do is blow out my hair, or let it dry naturally & then spray throughout my hair to give it a gritty, textured feel. Oh Bee Hive is filled with keratin & argan oil which are both necessities for healthy hair. The product speaks for itself, it’s perfect for all clients, all ages, chemically treated, or virgin hair. Now that people are finally beginning to shut up about coconut oil, here comes the newest trend.. argan oil. This is the product that started the buzz, it has won so many awards already & I don’t see it coming to an end anytime soon. It’s great for conditioning, styling, & finishing. 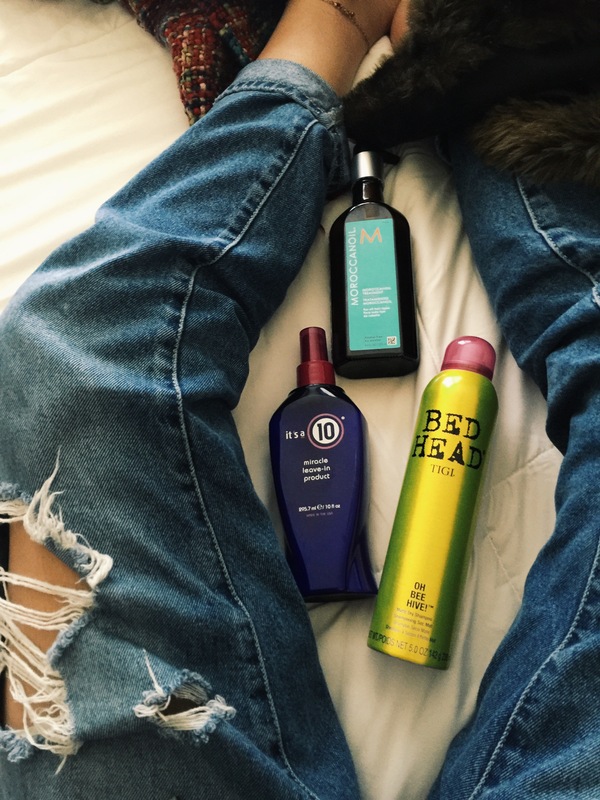 After running Moroccan Oil through your locks, you’ll instantly notice insane, shine & smoothness. There are so many short term & long term benefits of using this product, a must have for anyone that loves or strives to have healthy hair, aka every girl should have some of this liquid gold. My favorite products for myself & clients are ones that can be used for more than one purpose, that way you don’t have a thousand bottles of stuff you’ll never ever finish. Versatile products always win in my eyes, less is more.